Its got the pile of gifts, its got the fancy balloon bouquet, and yes! Its even got the giant number 21! This Have a Blast happy birthday card has everything you need to make somebody's big day even more special! Perfect for a close friend or relative, or even a new acquaintance! 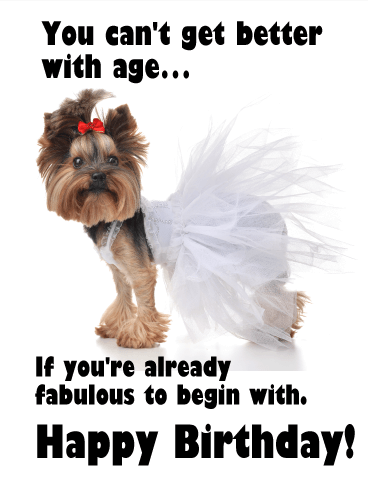 Send a smile with this jaunty birthday card! This darling card would bring a smile to anyone's face, but seems especially appropriate for someone who adores the color pink in all of its delicate shades! 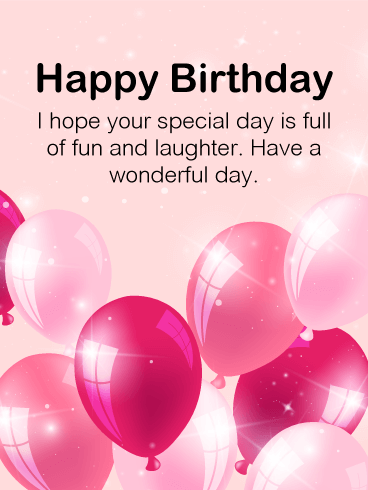 Perfectly rosy balloons float up from the bottom of this fun happy birthday card making it ready to be sent to your sweet friend or family member to wish them a special day! 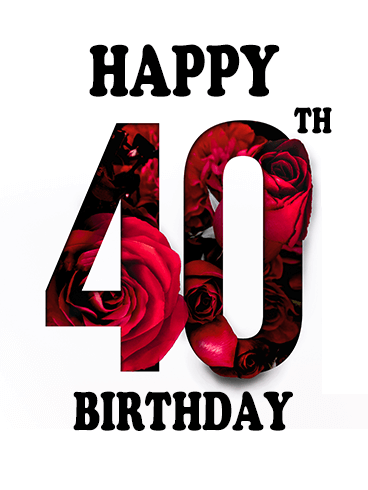 If you are looking for that perfect greeting card that celebrates a 40th birthday, you just found it! 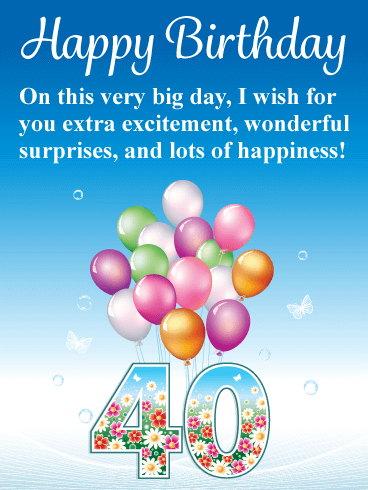 This exceptional birthday card showcases the number 40 in a beautiful way by filling it with lovely flowers. If that wasn't enough, it's being carried through the sky by colorful balloons. Such a wonderful sight to see! This charming birthday card will certainly add some joy to their day. Be sure to send these flowers and balloons in time for their big celebration! Milestones are very exciting, especially when it's a 40th birthday! It's an age where you are still young, but old enough to be much wiser. So a birthday such as this should be celebrated with an important and elegant birthday card. The cake displayed in this greeting card is fancy, fabulous, and perfect! It showcases designer candles that form the number 40, additional decorative birthday candles, a pretty red bow, along with confetti! What more could someone ask for! 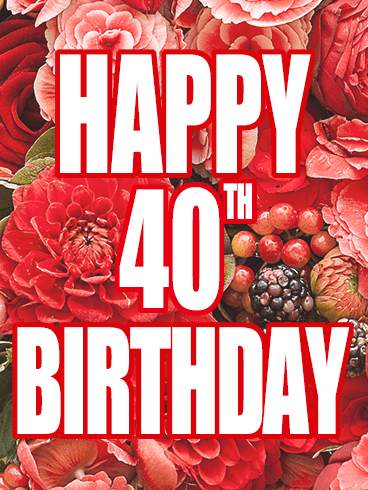 If you know someone who is turning 40 then help celebrate this exciting milestone by sending this spectacular birthday card their way! It features vibrant colors of pink and green, along with champagne glasses for toasting! Your friend or family member will feel very special after receiving such an exceptional birthday card such as this! 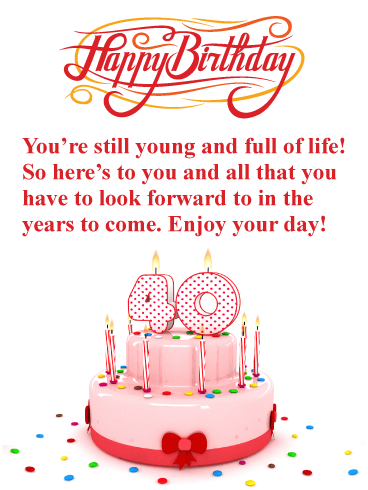 Remind them how important turning 40 really is and let them know you are thinking of them by sending this awesome happy birthday card today! Cheers! Slainte! Prost! Kompai! Salute, and to the recipient's health! Send this funny birthday card to the sangria loving, beer imbibing, wine sipping, adult beverage aficionado you know who is celebrating a birthday! 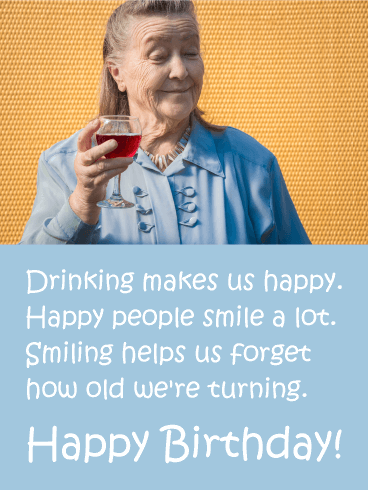 This birthday card shows a woman smiling happily with her glass of wine, and that's the sort of happiness you want to wish your friend on their big day! Happy Birthday and bottoms up! If there is one person above all, that a person should treasure, it's a friend who stays by your side, forever. As everything starts to recede with the tide, this person will stay stalwart by your side. As vision blurs and skin starts to sag, give this card to that wrinkled old bag! Because they are that treasure, whether near or far. Fall Apart Together with this Funny Birthday Card. It's your birthday and you can throw your cake if you want to! 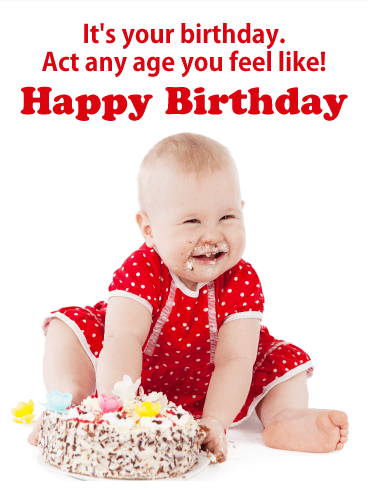 This funny birthday card sets the mood for a silly day by showing a happy baby smashing their cake accompanied by the message "act any age you feel like!". Let your loved one know that however they want to spend their birthday- you support them and have their back one hundred percent! Is it possible to get more fabulous than this absolute cutie of a dog wearing a darling little red hair bow and poufy, white dress? If you answered yes- then you must have somebody ultra-fabulous celebrating a birthday! Why not send them this funny birthday card to let them know you see their sparkle and you want them to keep shining! This birthday card puts a fun twist on a classic card with a cake on the front. After all, this isn't just any cake. It's two-tiered, pink, and looks good enough to make the recipient wish it was real! The sparkles in the background add a whimsical element, while the cursive font of the words adds a more sophisticated touch. What's not to love?! Doesn't this cupcake look good enough to eat?! 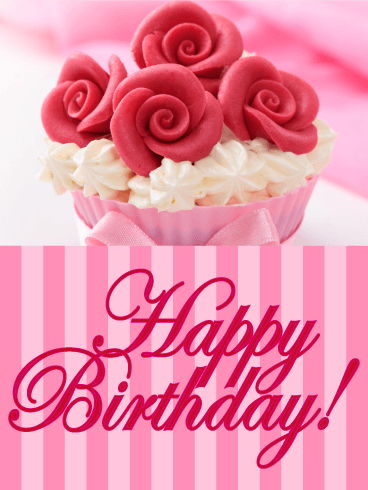 The rose frosting decorations are perfect, because they appeal both to sweets lovers and flower lovers. We can't forget about the gorgeous shades of red and pink that really help tie this birthday card together. For the special someone in your life who loves all things sweet, this is the birthday card you've been searching for! 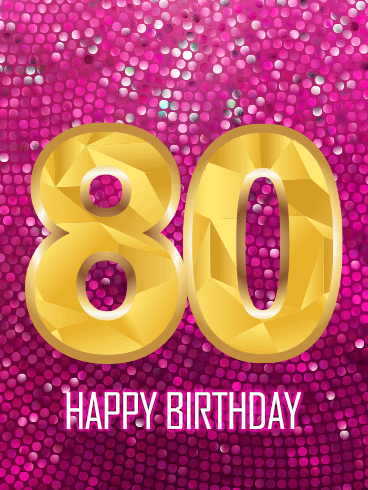 Let's celebrate this 80th birthday with a disco! Ok, maybe we won't go that far, but this bright birthday card is a fabulous substitute! The pink background will make the recipient feel like they're right back in their younger years, beneath the disco lights, while the geometric-patterned gold letters make this card even more fun. 80 has never looked so good! 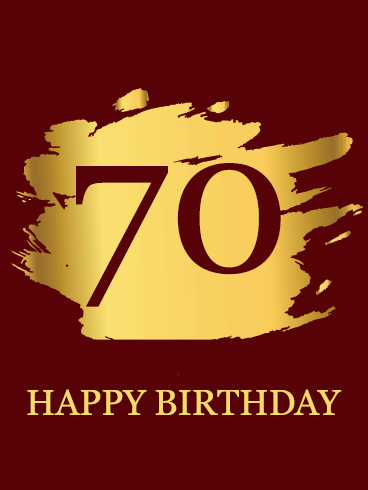 Turning 70 deserves a fantastic celebration, and what better way is there to kick it off with a bang than with this exciting birthday card?! The party hat on the zero is both fun and hilarious, while the fireworks add a unique flair. 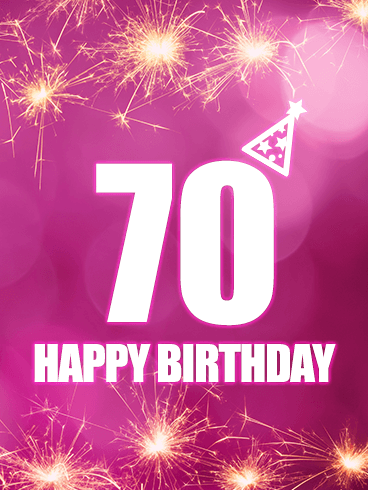 For the person in your life turning 70, be sure to snag this bright, electrifying birthday card. 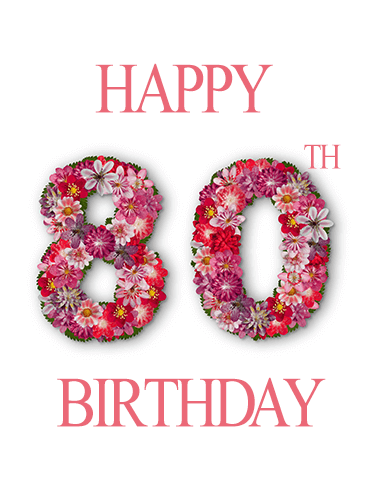 Looking for the perfect birthday card for someone special turning 80? We've got you covered. 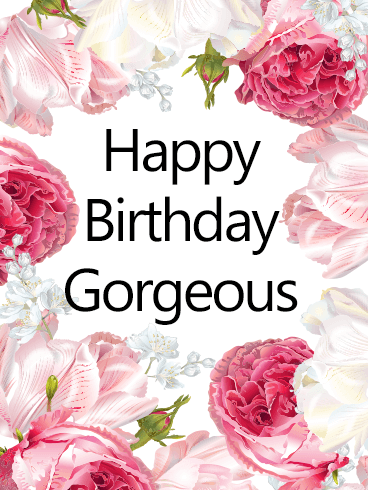 In the midst of all those overrated, overused cards that joke about getting old, we have this gorgeous floral number. This is a one-of-a-kind card with beautiful shades of pink and red and a subtle touch of greenery for good measure. This one's sure to be a hit! Isn't there something just something so lovely about pairing maroon and gold together? The abstract paint strokes behind the number 70 add an artistic element while also incorporating the gorgeous gold color into the card. 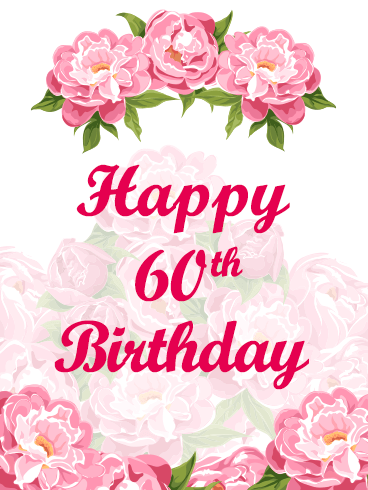 This birthday card is simple but still gorgeous, and would make a great choice for any parent, grandparent, aunt, uncle, or friend celebrating the big 7-0! Birthdays are always an important day, but they are even more important when you are celebrating the start of a new decade. 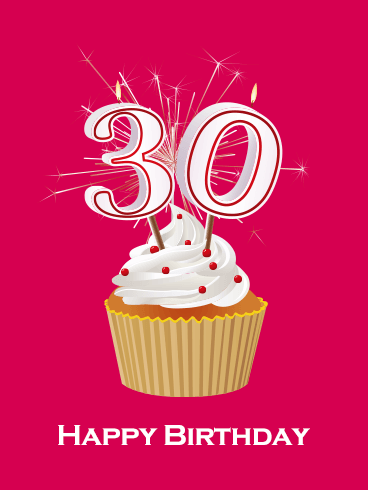 If your friend or family member is celebrating her 30th birthday, use this bright and colorful birthday card to share your birthday wishes and love! The pretty and yummy cupcake and sparkling candles will get them excited for their special day and show how much you care! What is the best part of a birthday celebration? The birthday cake, of course! When you have a birthday that is as special and important as an 18th birthday, one cake is not enough. 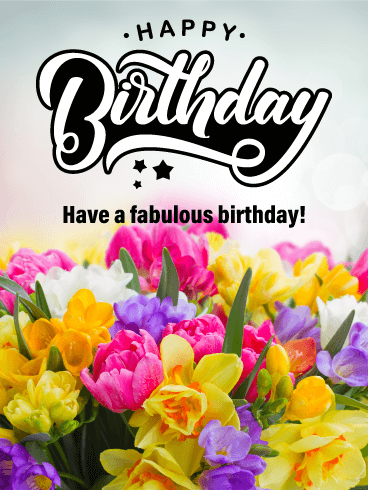 For your loved one's birthday, use the variety of three different birthday cakes on this fun Happy Birthday card to make this the best day ever! 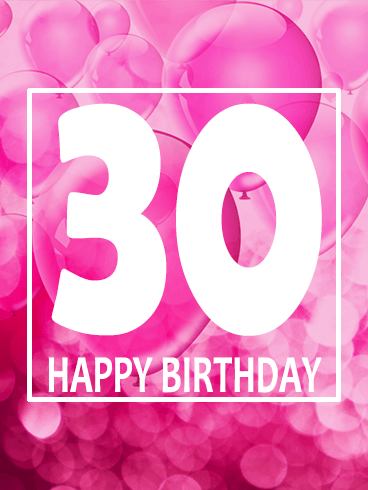 Is your best gal pal turning 30? Then this is the best Happy Birthday card to send for a fun celebration! The bright pinks and celebratory balloons will start the party for this special day and show your loved one how excited you are to celebrate! She is the most beautiful, caring, and amazing person you know, so use this Happy Birthday card to give her the day she deserves! 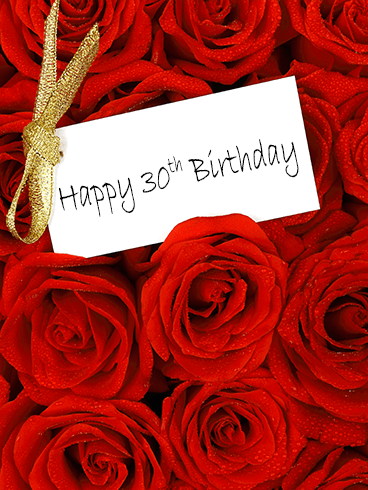 What is the best way to celebrate your sweetheart's birthday? With beautiful red roses that show the depth of your love and affection for her! 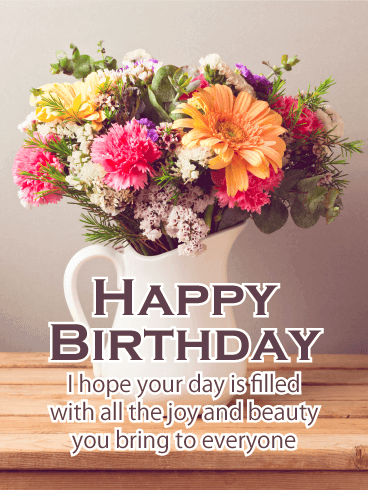 Every woman loves to receive red roses on special occasions, so the floral design on this gorgeous Happy Birthday card is the best way to celebrate her special day. Your sweetheart is the most incredible and beautiful person you know, so give her the birthday she deserves! Do you know someone who is glamorous, cool, and about to celebrate an important birthday? Then send them this hip Happy Birthday card! 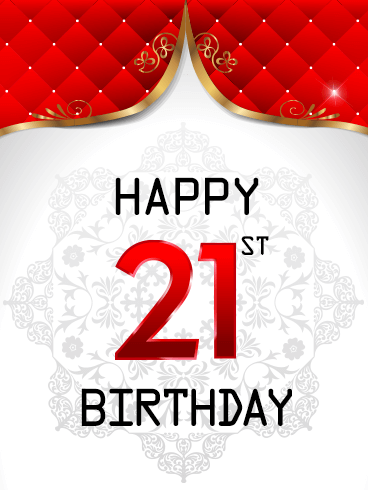 Turning 21 opens the door to many exciting new adventures, like going to clubs and finally having the legal ability to enjoy alcohol. 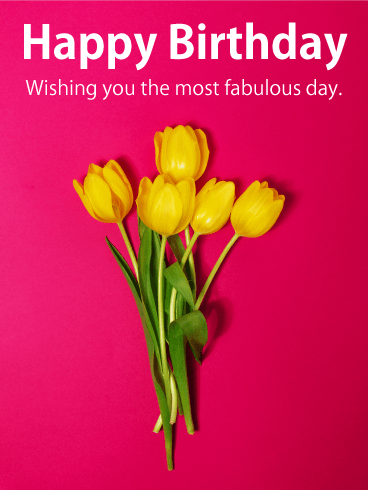 For your loved one's birthday, send this Happy Birthday card to help make great memories of such a special day! 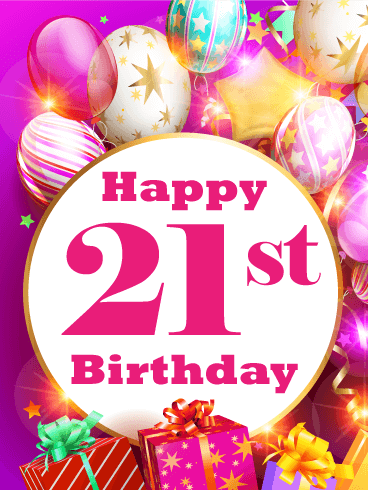 Birthdays only come once a year and 21st birthdays only happen once in a lifetime, so it's important to make sure that your loved one's 21st birthday is the very best day. 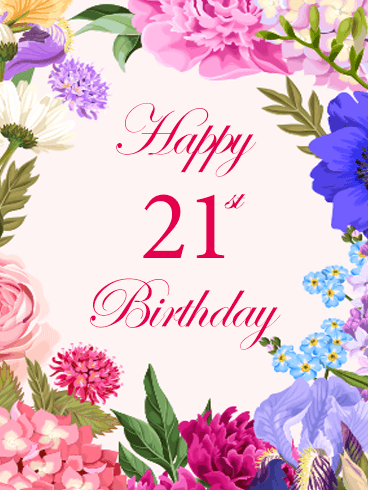 With the elegant design and luxurious colors on this Happy Birthday card, you can show your loved one how important they are to you. 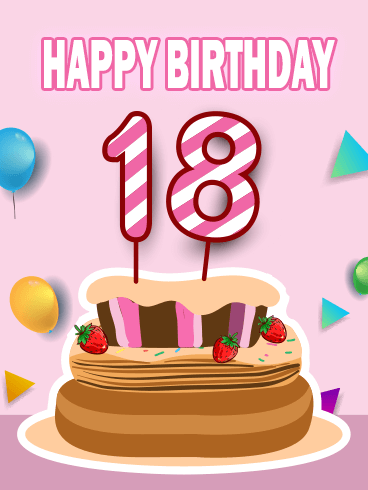 Birthdays should be filled with love and joy, so use this card to show your affection today! 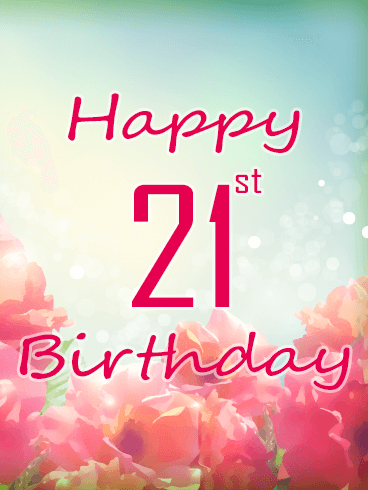 Do you have a special lady in your life who is about to turn 21? 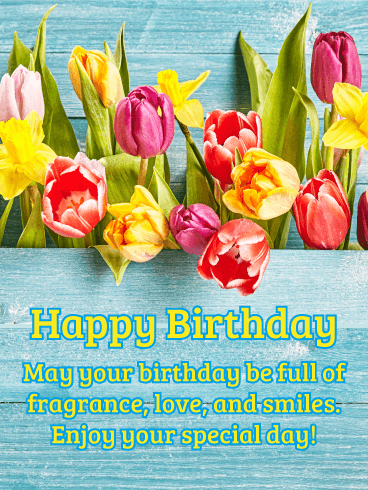 Whether it's your sweetheart, sister, or friend, this Happy Birthday card is the very best gift to give for the greatest celebration. 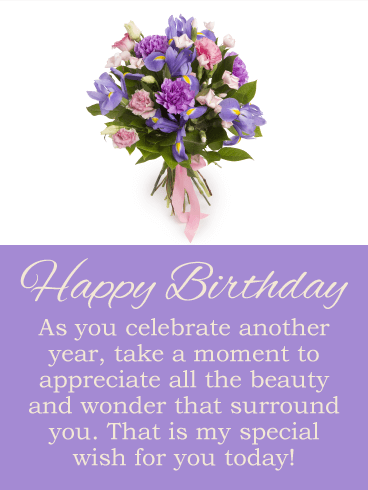 The bright colors and beautiful floral design will delight the birthday girl and show how much you love her. She deserves the best, so make sure she gets a Happy Birthday card she will love! Everyone knows that flowers are the perfect gift to give to the women in your life who are most important to you. 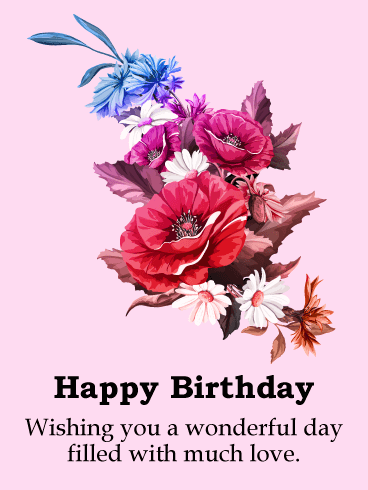 Birthdays are the best time to give gifts, so use the beautiful pink flowers on this Happy Birthday card to wish your loved one the happiest of birthdays. 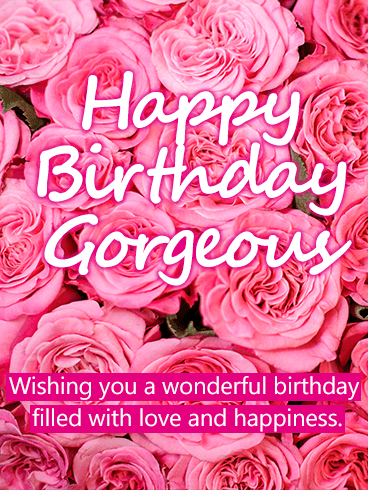 By sending this card and a message that offers celebrations and an expression of your great love for the birthday girl, you can give her a wonderful birthday! This birthday card takes floral and fabulous to entirely new levels! We dare you to look at this birthday card without smiling. The bright pink flowers are simply stunning, and the faded background really helps add dimension. 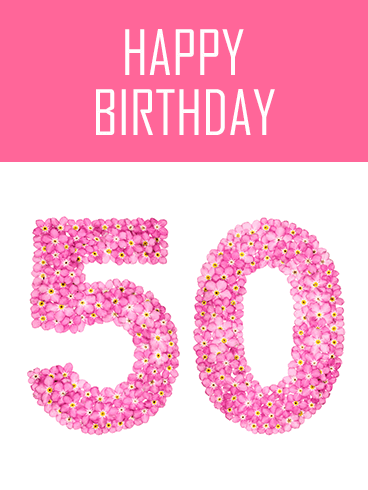 Throw in the dark pink script, and you have a gorgeous card that is sure to make the soon-to-be sixty-year-old in your life grin from ear to ear! 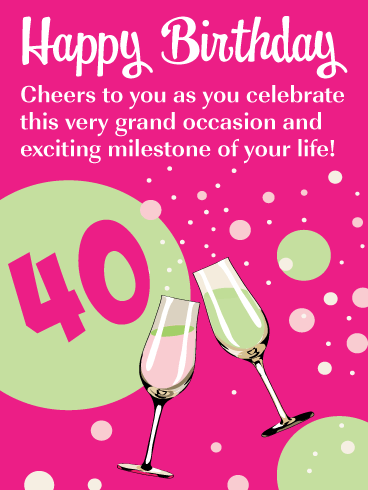 For the person in your life turning forty in the fall, this birthday card is a definite winner! 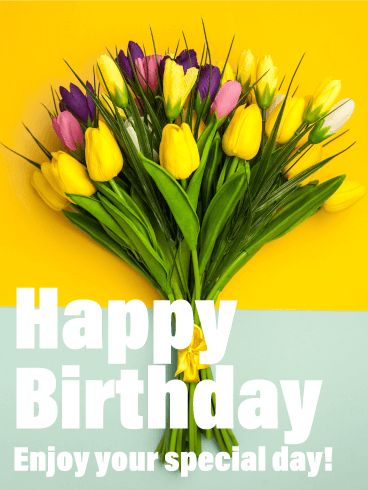 The reds and browns and oranges of the flowers and fruits really make this birthday card stand out, and the colors combine to make a magical background. Whether you're searching for a birthday card for a sibling, friend, or co-worker, this birthday card surely fits the bill! Is there anything a birthday girl could possibly want for their sixtieth birthday more than lots of pink roses?! If you can't afford to buy a few dozen roses, this fabulous birthday card is the next best thing. 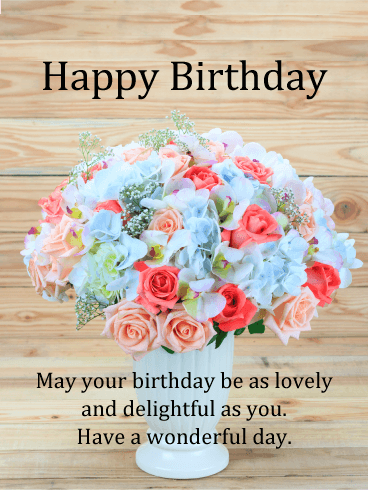 The birthday card is a gorgeous balance of colors and simplicity, simple enough that you can customize it for anyone special in your life. 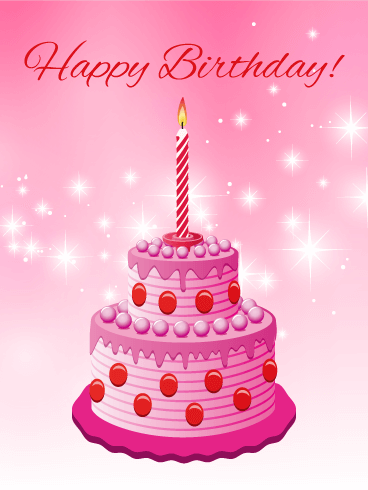 Nothing screams "birthday girl" like bright pink balloons and an exciting birthday card! 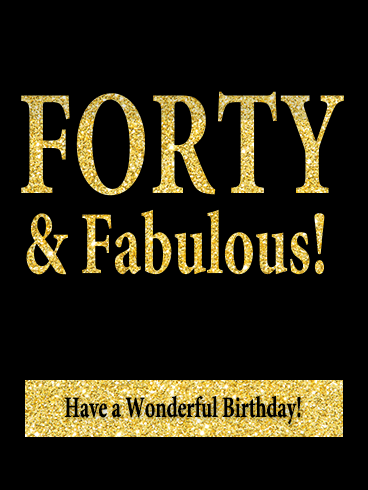 This sweet card is perfect for the woman in your life turning forty. The design is simple but eye-catching, and the recipient will be so grateful that you thought of her. Wishing the birthday gal a wonderful day is just the icing on the cake! Who says flowers are only for Valentine's Day or anniversaries? Not anymore! This birthday card makes a statement with the bold rose-printed numbers, with pops of roses outside the number lines for a unique pop. The texture adds a one-of-a-kind element and really helps this birthday card stand out. 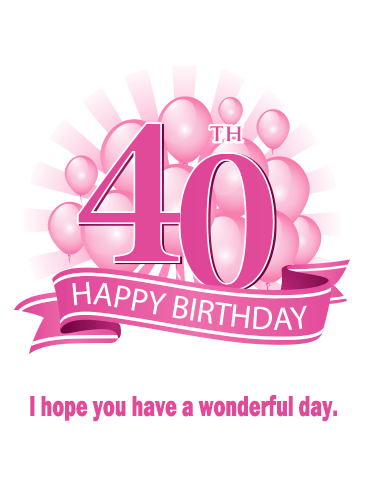 For anyone in your life turning 40, this is the birthday card you've been searching for! This birthday card is sure to make any birthday guy or girl grin-and chuckle! After all, who doesn't want to be called fabulous on their birthday?! 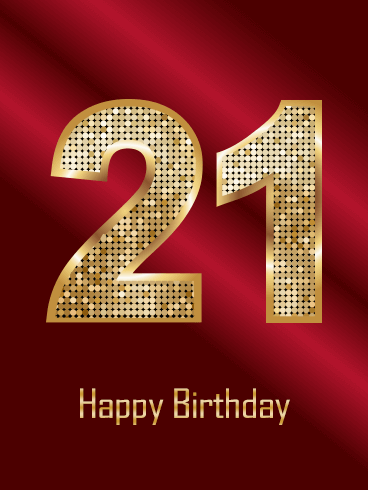 The simple colors of this birthday card keep it elegant, while the gold glitter adds a whimsical element. 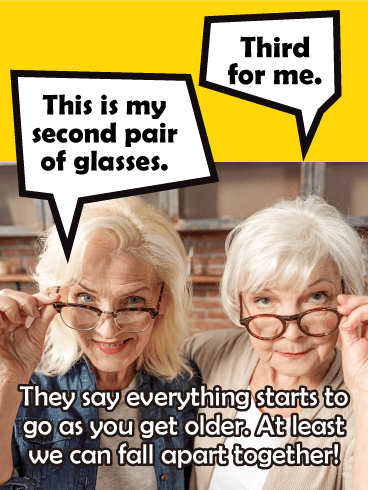 Whether you're searching for a birthday card for a sibling, a neighbor, or a co-worker, this is a great match for anyone turning forty! Turning 50 is a huge accomplishment and you know a beautiful woman who deserves the greatest celebration for such an important birthday. With this Happy Birthday card, you can give your loved one a birthday gift that shows how much you love and support her! 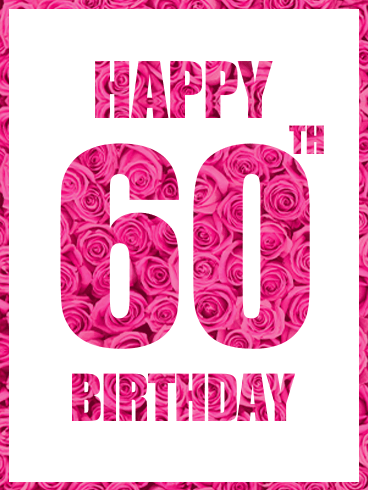 No one deserves an amazing birthday more, so send your loved one this Happy 50th Birthday card today!